One of my earliest Frozen Memories® is of my Dad coming home one winter afternoon and building an ice rink in our backyard. He’d brought some small plastic tubing from the shop at our family’s business that my grandfather, Irving J. Stoller, had started in 1948 as a maker of poly- coated paper drop cloths. My Dad Jim Stoller, Sr. had joined the business in 1963 and over the years the company developed new and creative plastics solutions and applications for the flexible films it converted and distributed ranging from construction, agriculture, packaging & industrial amongst many other proprietary applications. Like my grandfather, my Dad was a creative kind of guy who was always coming up with new ideas. On that winter afternoon, he took that tubing and laid it around the patio, then filled up the interior with water that froze overnight into the first Stollerena. And from that day on, that little rink ended up making ours a Skating family, with a capital S! My Dad made that rink for only another season or two because it took soooo much time and effort to flood, freeze, flood, and freeze every night, and because the plastic tubing didn't really hold the water in too well. However, my brothers and I continued to skate and joined the local mite teams in our area, and moved on to the "AAA" ranks in Chicago, IL. During those years we had Mom and Dad running all over the place, as we’re sure you do as well. Three boys between two parents made for some tricky nights of making three "AAA" practices at three different rinks, a real scheduling nightmare. Later in our childhood we moved near a lake, so if we wanted more ice than three or four nights a week, we'd head down to get a few more hours of ice in until the surface was either too bumpy or littered with rocks by our 8 year old brother Bryan, who was trying to see how far he could make them could slide. Those were great skating days when lakes stayed frozen and a kid could step into an outdoor winter play land anytime. My brother Ken and I went on to pursue our boyhood dreams by playing Junior "A" in the USHL. And after a year playing in the USHL with the Dubuque Fighting Saints I permanently joined the family business in 1987. Having already spent my teenage summers working in the factory, I used those first years to learn the complete ins and outs of the operation. My Dad and I also embarked on our first rink-building adventure when we donated a plastic liner to the local town and flooded a parking lot to make an ice rink. The liner held the water fine, but the town didn't take care of the ice and the rink didn’t attract many skaters. During the winter of 1991, I also tried to make my own backyard ice rink. I started like most novices do, by spraying the grass and spraying and spraying – and spraying and spraying to build a whopping half-inch layer of ice (whoopee, not!) the first night, only to have it disappear the next day. "This is ridiculous," I thought. Who in their right mind would continue this losing fight against Mother Nature? Then, the light bulb went on. The very next day, we cut the first NiceRink® liner, installed it in the yard, filled it that night and had a frozen-solid ice rink the next. It was that easy. I benefited from a small 10' x 20' level area the first year and was able to get my then 11-month old son out on the ice with me. (In our family, we like to say that if they can walk, then put skates on ‘em—and to this day my son Tyler, daughter Tatum and nephews Christian, Dominick and Devin are all serious skaters.) They have all been getting involved in the company to bring in the company’s fourth generation. I wondered how many other crazy rink-building parents of little skaters would enjoy this ease of sitting inside and watching a rink fill and freeze on its own. It turns out, a lot! We came to find out that seasoned outdoor rink-building veterans had already been using tarps or consumer-grade plastic sheets for rinks. But what made our rinks different from the start was the quality of the liner materials. And that’s the essence of the NiceRink® IcePerience®. NiceRink® liners aren’t just common sheets of plastics. Our materials are made for industrial applications, which require much more strength and durability characteristics than readily available 6-mil poly film. NiceRink® liners are made from top of the line, engineered layered films that are created to be lightweight, yet durable enough to withstand ten times the cold weather and abuse of cheap clear plastic sheets. NiceRink® liners are manufactured at almost any size in one piece from a 25’ x 45’ Starter Rink to full NHL Rink 90’ x 205’ and beyond. So there is no need for taping or gluing two sheets of 20' x 100' together to get the size rink you’ve dreamed of. With a passion for ice, how could we stop there? We kept tweaking and inventing, and have wound up with a whole suite of other components to enhance the backyard rink-building and maintenance experience. The one-piece NiceRink® Brackets turned out to be a real back and time saver. Next we introduced the NiceIce® Resurfacer, which cuts down the time spent on each flood of the rink. And after replacing my boards once and foreseeing yet another board replacement, I thought there had to be a better board to use than wood. Turns out there wasn’t, so we created the slide in place, lightweight, long lasting NiceRink® Thermoformed Plastic Boards. Each season we look for better and brighter solutions, such as our 2016 under liner LED NiceLights addition. Today, with the NiceRink® "BIG 4" (liners, brackets, resurfacers, boards) firmly in place, it's our customer service and client loyalty that lead us to the next level. 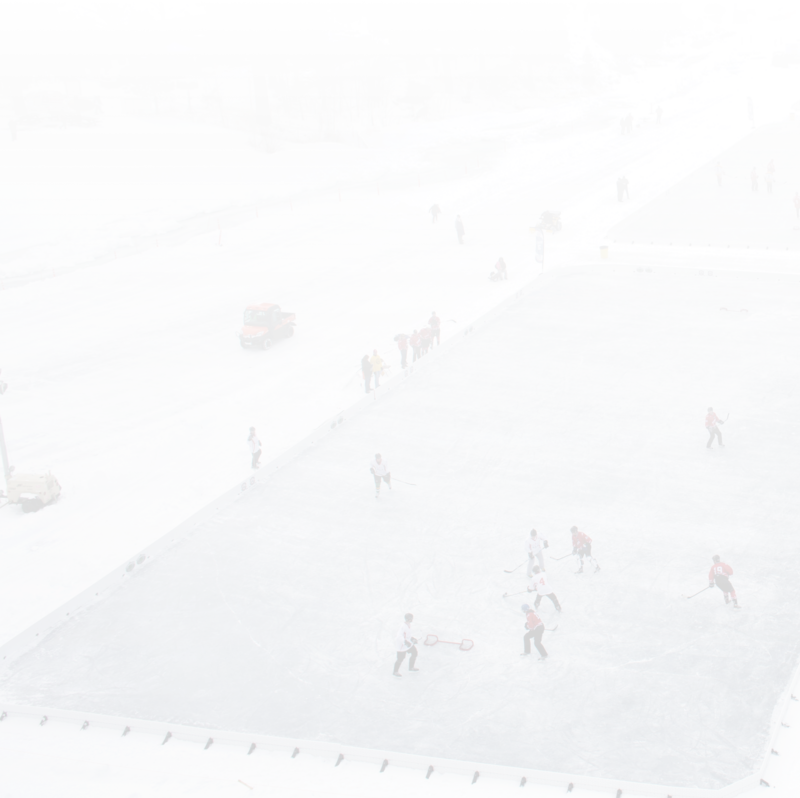 Our mission has always been to provide simple yet effective solutions for making and maintaining an outdoor ice rink. And, because we’re skaters ourselves, it’s also been our goal to provide products to help develop each skater’s creativity and abilities without limitations. Most of all, we want you and your family to have fun. With NiceRink®, you can start creating Frozen Traditions® and making Frozen Memories® of your own this winter and each one thereafter that we guarantee will last a lifetime. Our materials are made for industrial applications, which require much more strength and durability characteristics than readily available 6-mil poly film. The NiceRink® liners are made from top of the line, engineered films which are made lightweight, yet durable enough to withstand the cold weather and abuse ten times that of cheap clear plastic sheets. They can be manufactured almost any size in one piece, so there is no need for taping or gluing two sheets of 20' x 100' together to get the rink you really want.